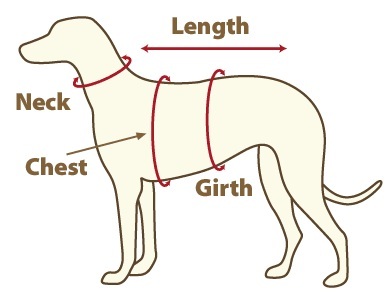 To find the correct dog clothing size, measure the length of your pet's body along the spine from the base of the neck (where the collar sits) to the base (not tip!) of the tail. Please make sure your pet is standing upright to get an accurate measurement. Sizing can vary greatly between different pet clothing designers so please be sure to measure your pet, if your pet wears a medium in one brand this doesn't necessarily mean a medium in the others too.